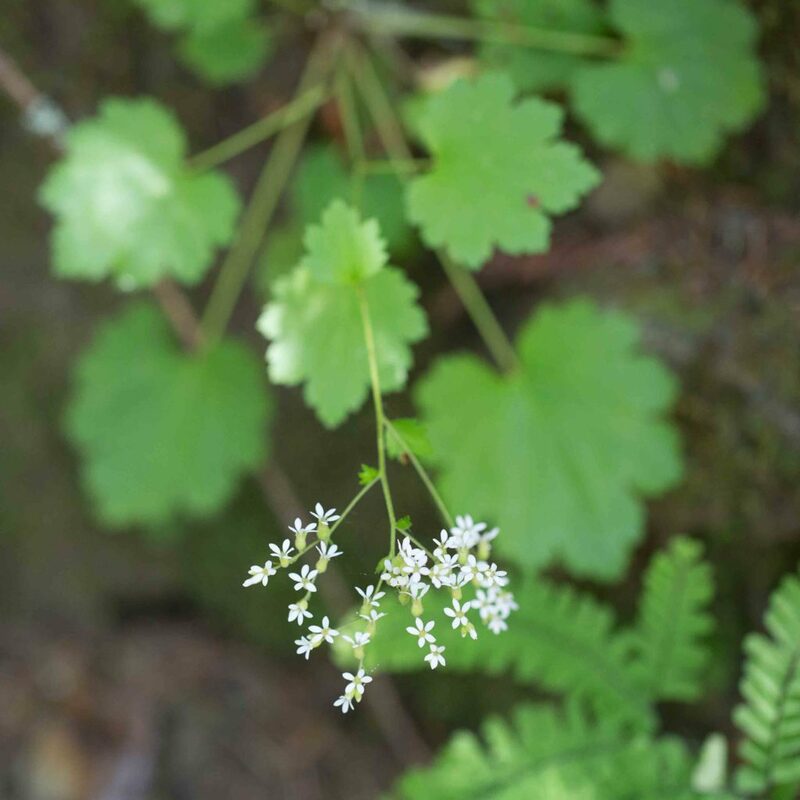 Aptly named, this is found by streams or on the faces of waterfalls. 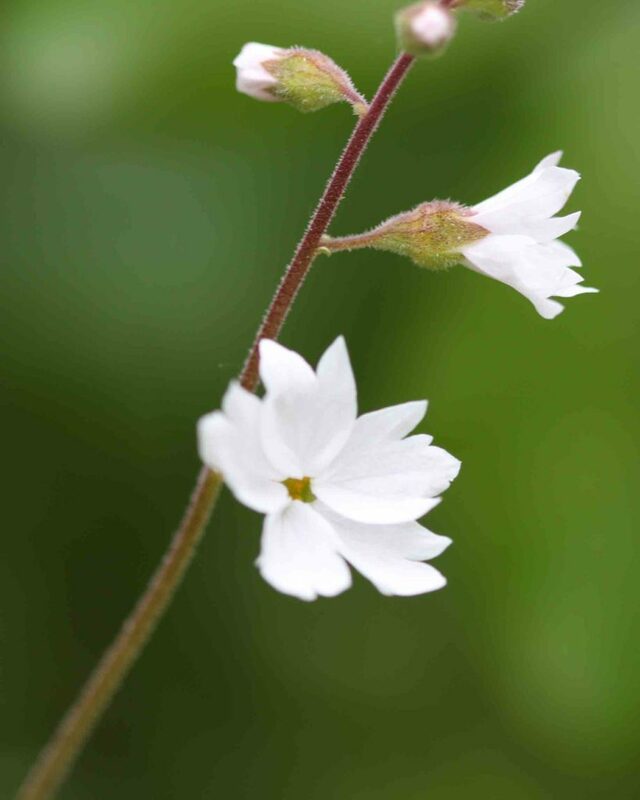 It has distinctive indented, round to ovate leaves. 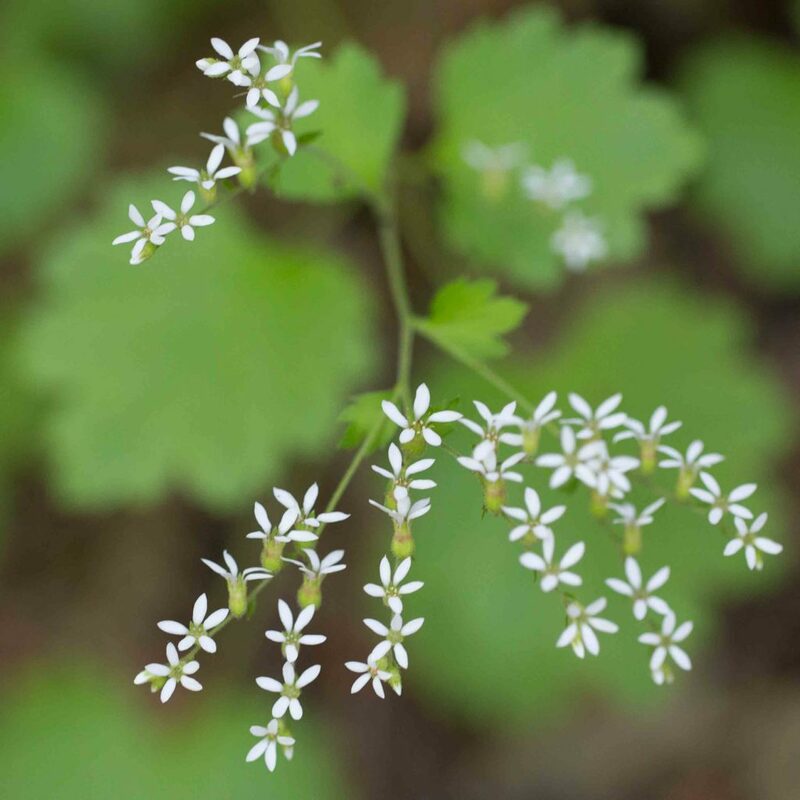 The diminutive 5-petaled flowers are white and bell-like, in small open clusters. 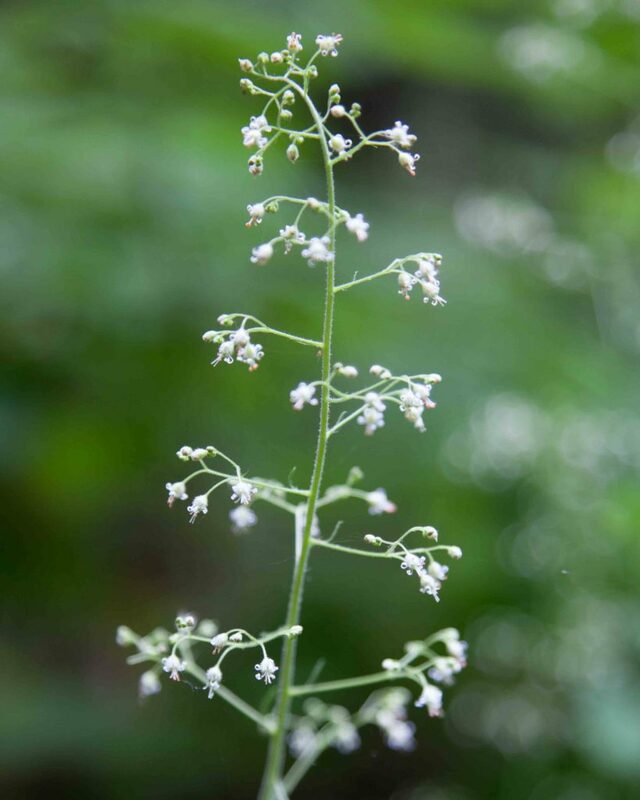 Peduncles are slender, erect, long and branching with minute, brown, gland-tipped hairs. 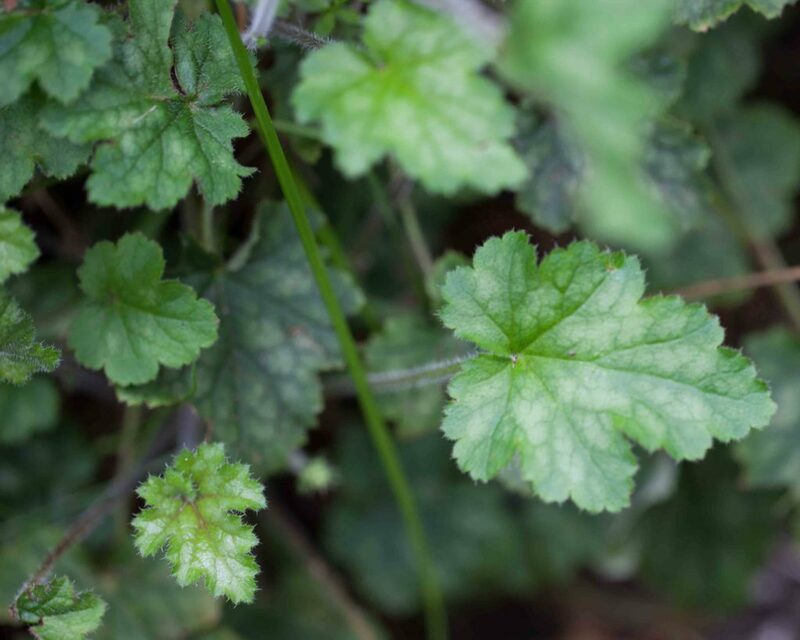 This is easily recognized by its distinctive, deeply 5–7-lobed leaves with prominent reddish dark veins. 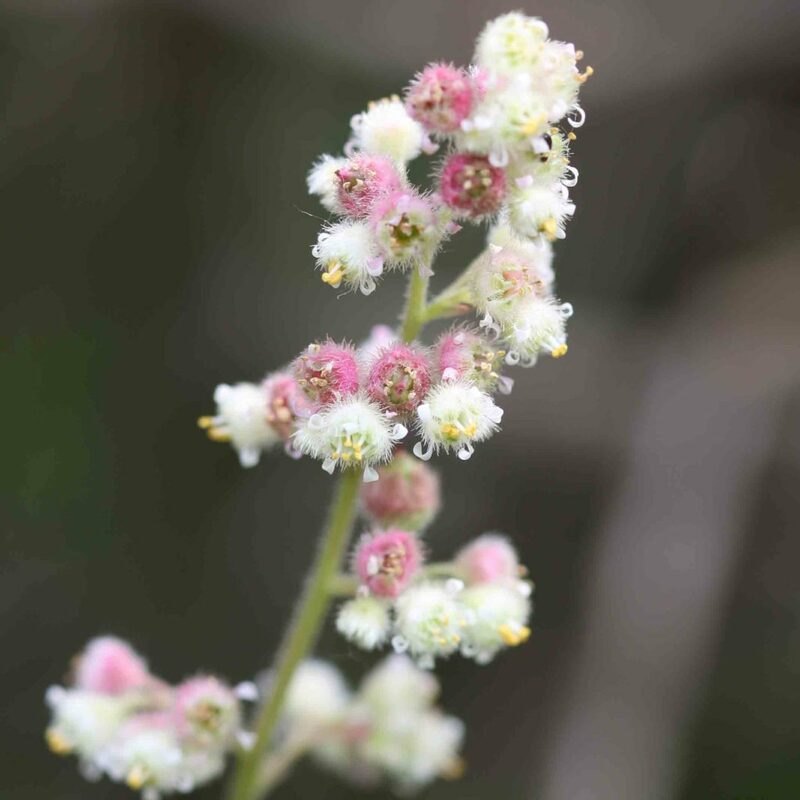 It has a tall slender stem with lateral peduncles bearing many tiny white and pinkish flowers with a tapering, slightly hairy hypanthium. 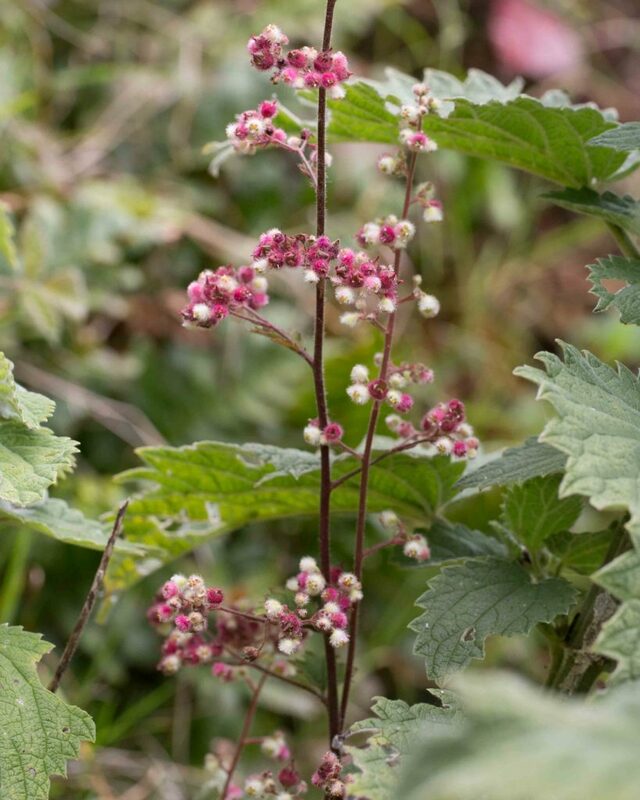 A much smaller plant than Small-flowered Alum Root (Heuchera micrantha) and with a generally more compact appearance. 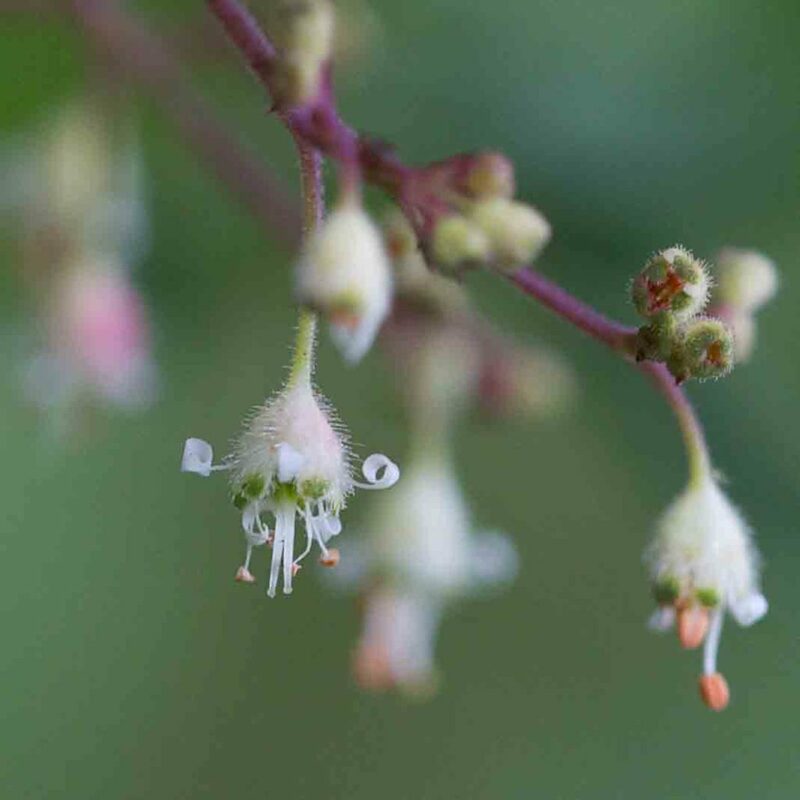 The flowers are noticeably different; these are in denser clusters, have less exserted stamens, and are rounder and densely hairy. 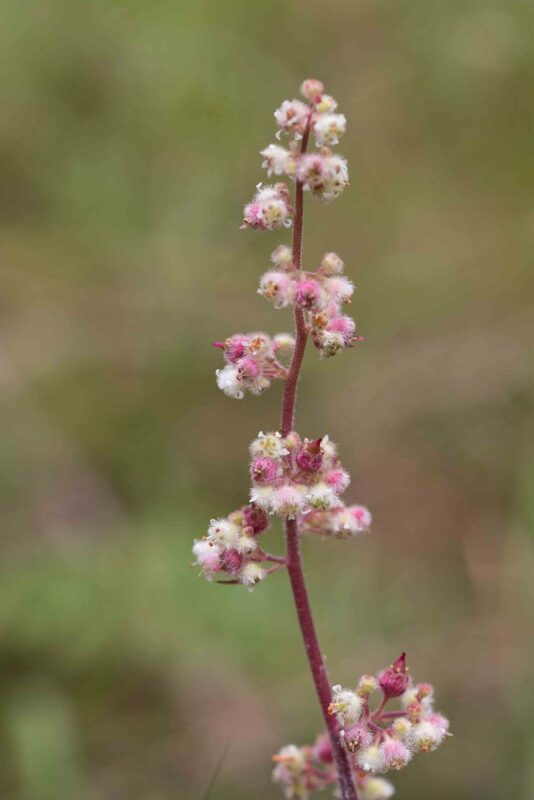 Calyx lobes are pink to red. 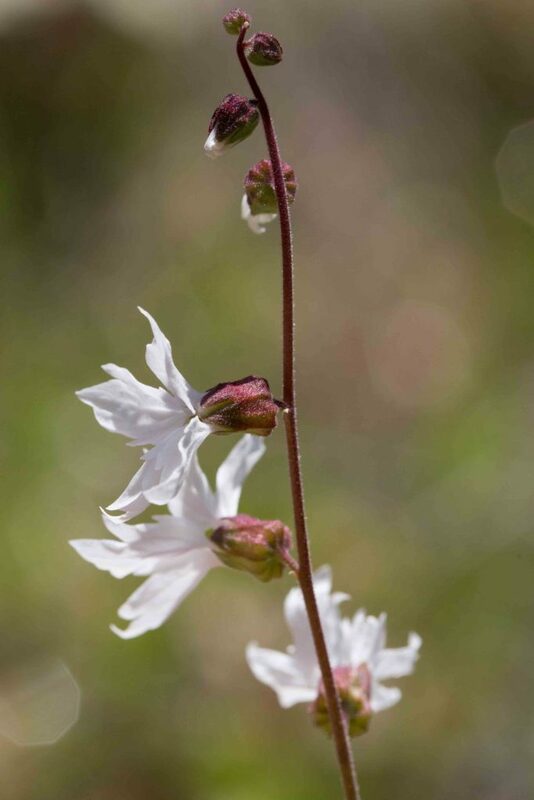 This and Hill Star (Lithophragma heterophyllum) are two equally beautiful early spring bloomers with similar pure white flowers and growth habits. 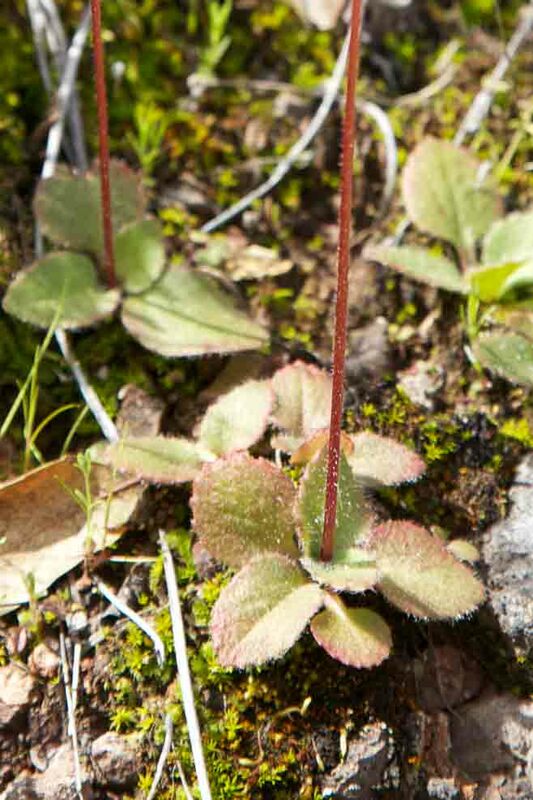 The slender, many-flowered stems may be either green or reddish. 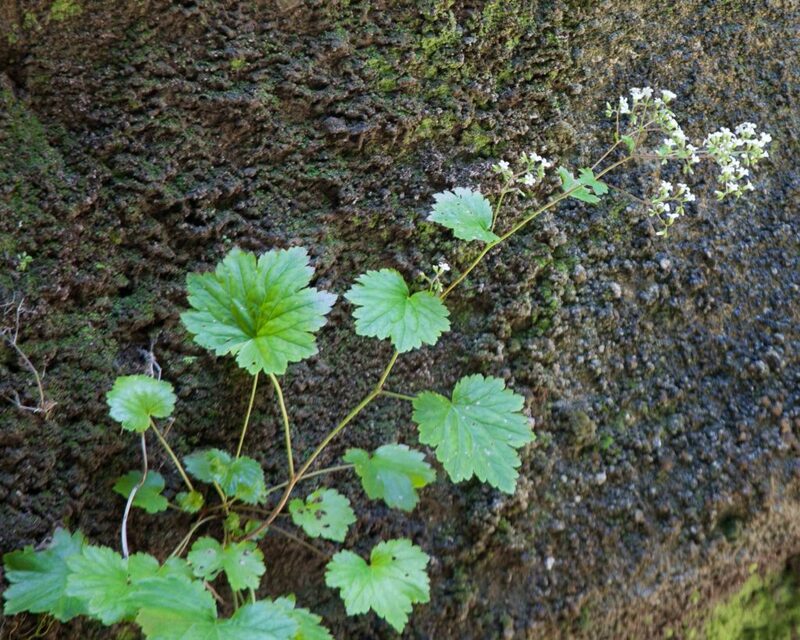 The two species are readily distinguished by their hypanthium. 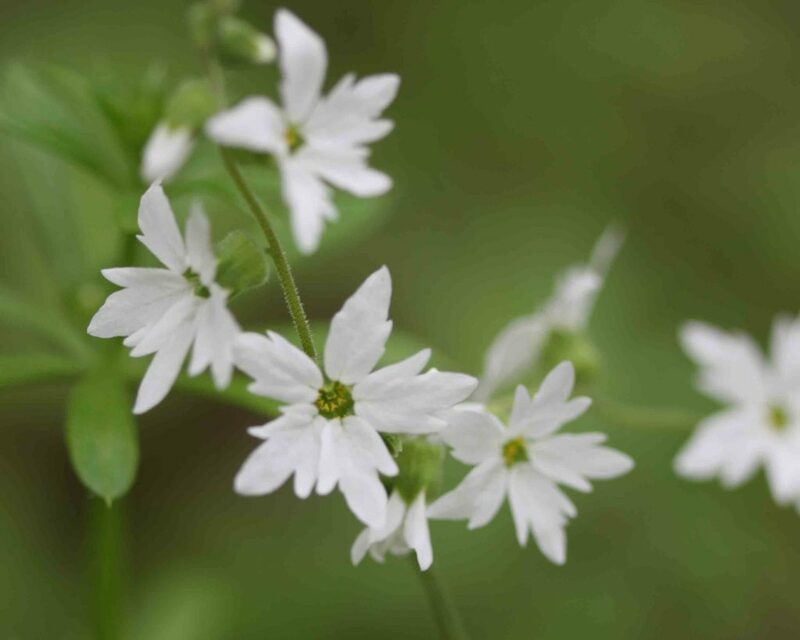 Woodland Star has an obconic, tapered hypanthium. 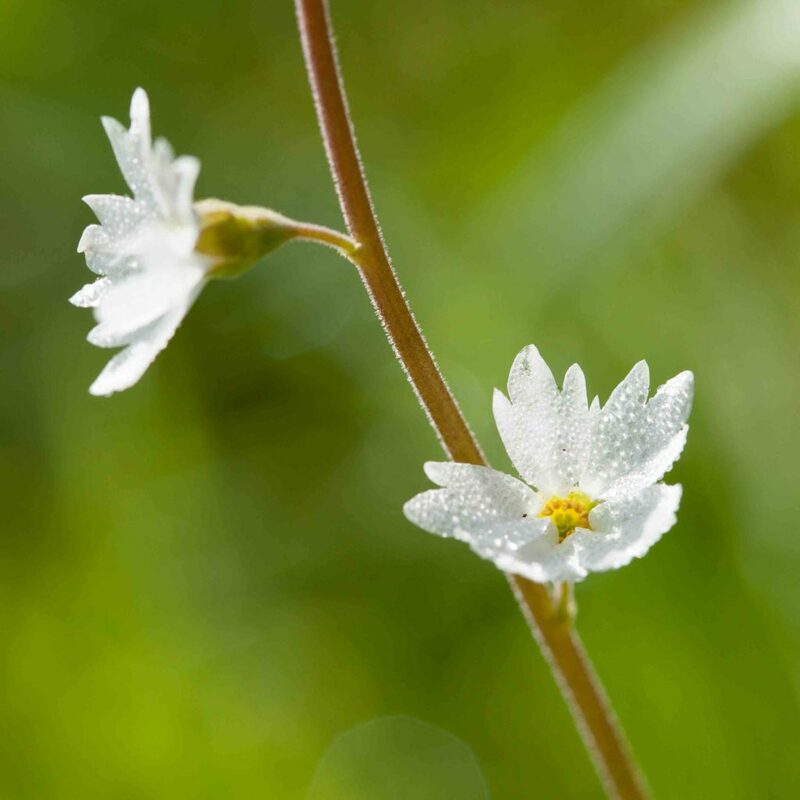 Hill Star’s is truncate, with a squared-off base. 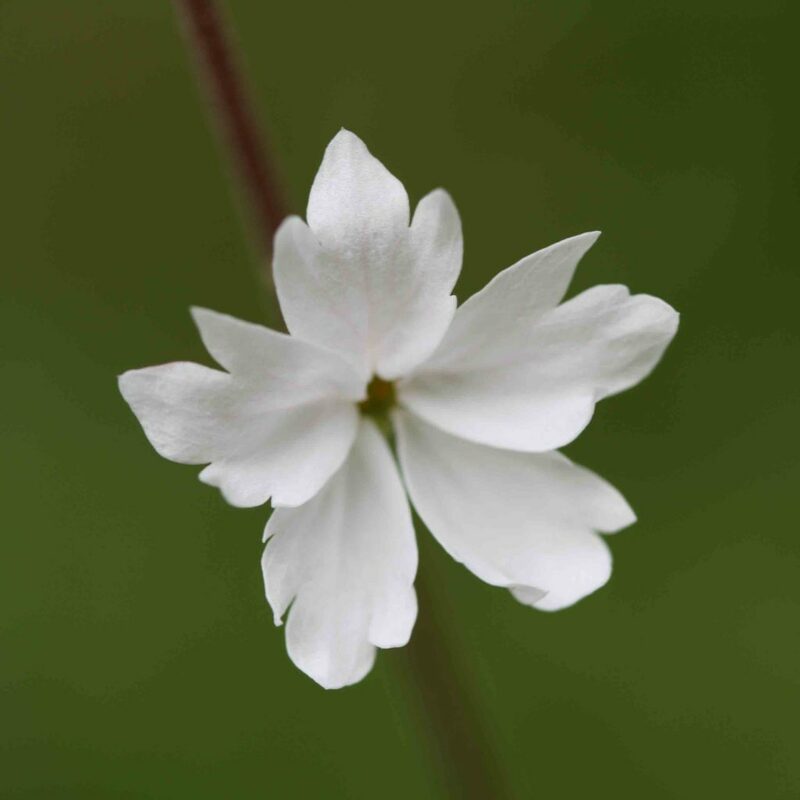 This and Woodland Star (Lithophragma affine) are two equally beautiful early spring bloomers with similar pure white flowers and growth habits. 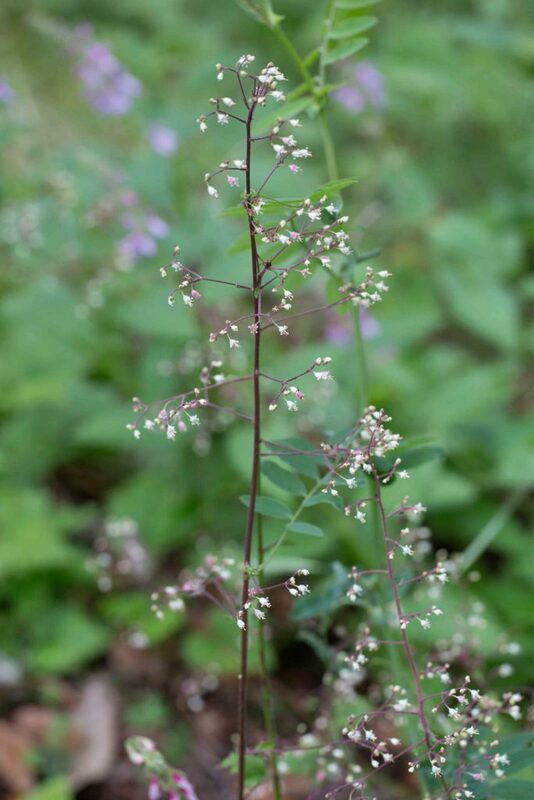 The slender, many-flowered stems may be either green or reddish. 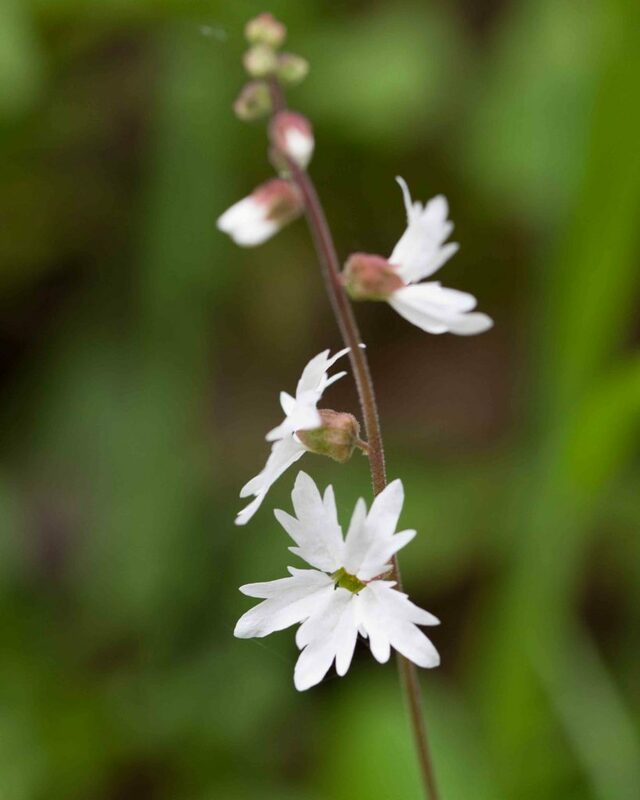 The two species are readily distinguished by their hypanthium. 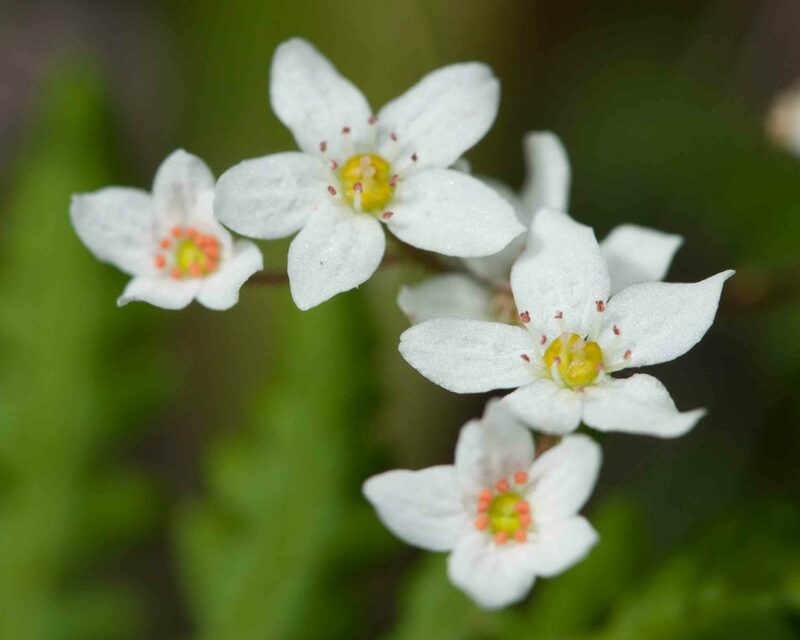 Hill Star has a truncate hypanthium with a squared-off base. 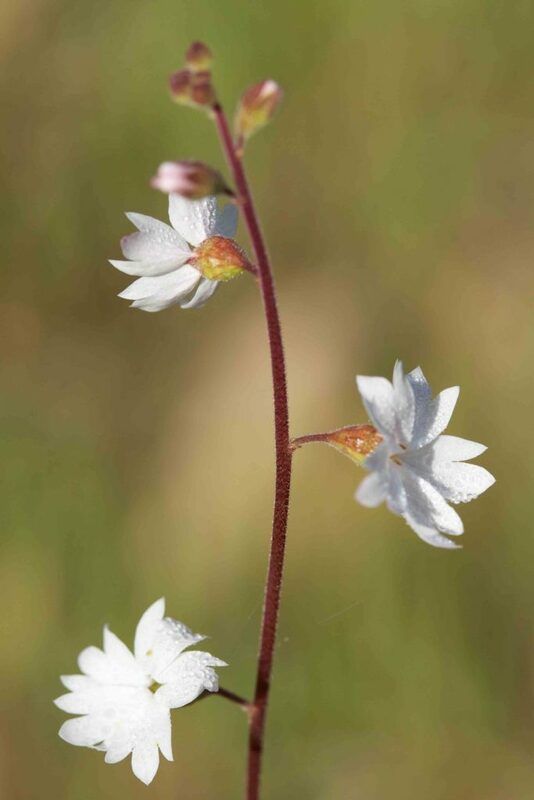 Woodland Star has an obconic, tapered hypanthium. 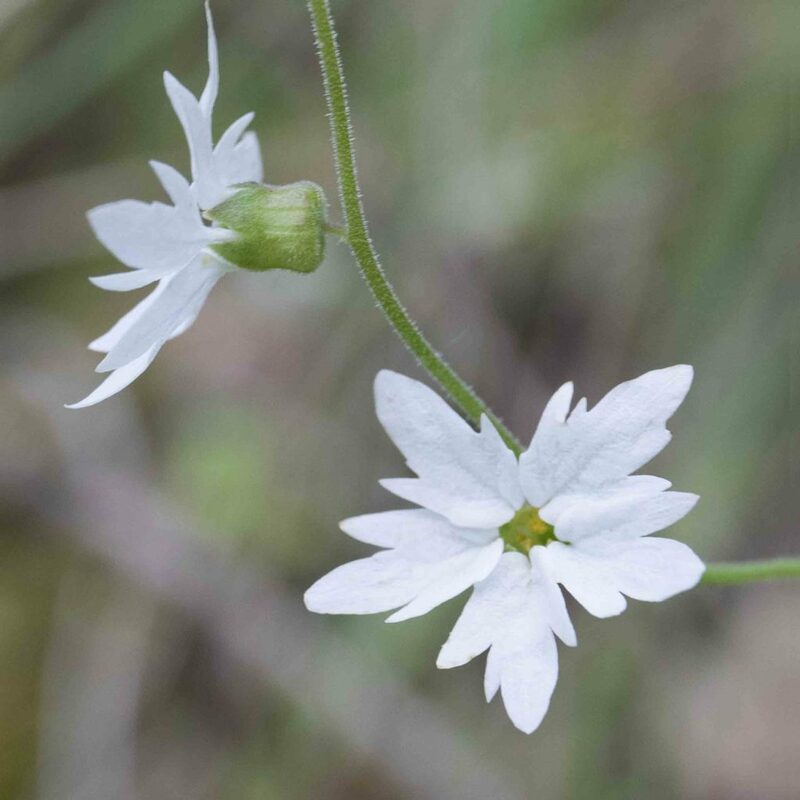 This is another common early spring bloomer, sometimes found in profusion. 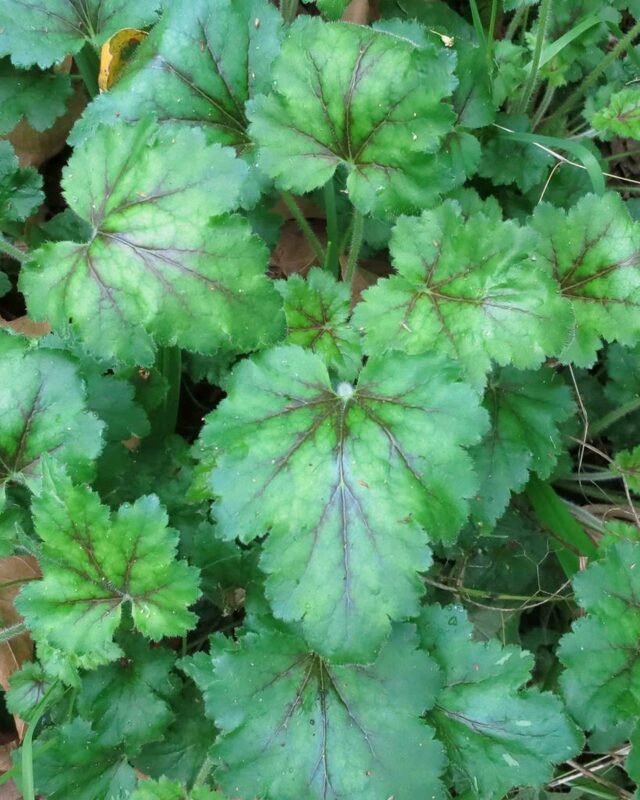 The leaves are in a basal rosette, hairy and slightly toothed. 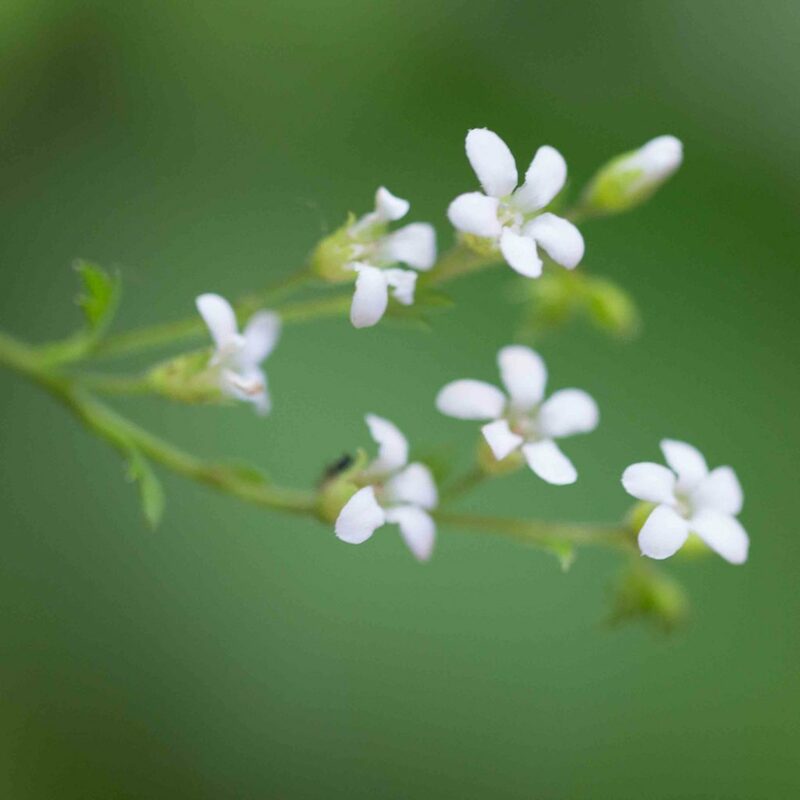 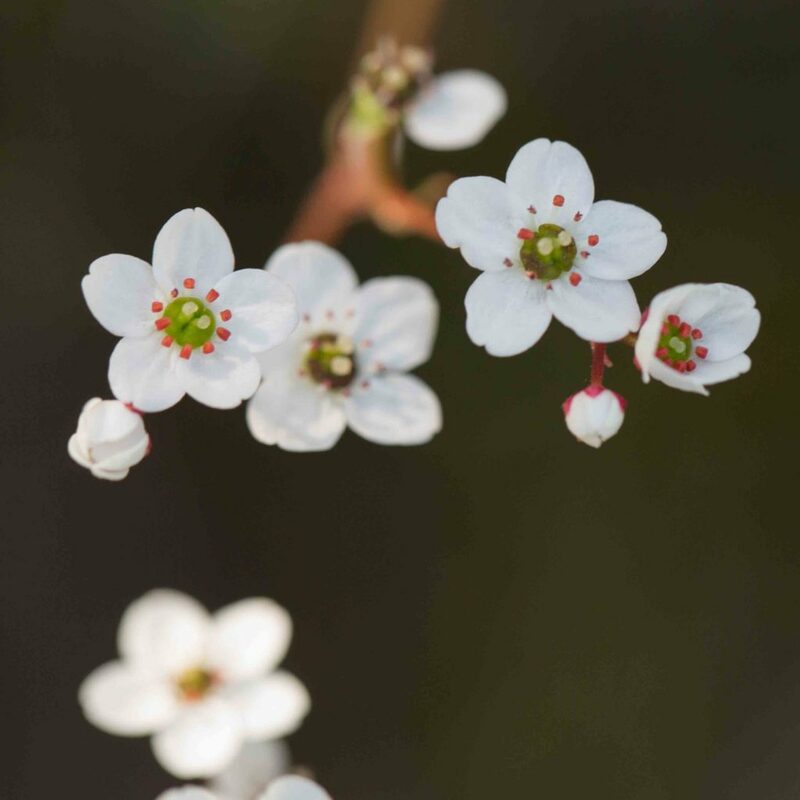 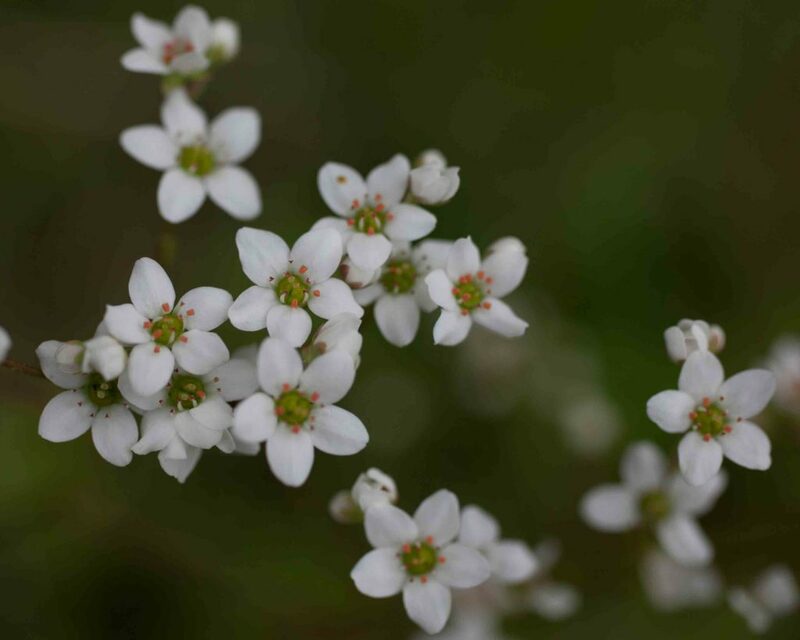 There is a single stem, long and branching, green or red, bearing loose clusters of small white flowers, 5-petaled and with 10 bright orange-red anthers.